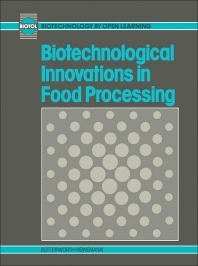 A thorough examination of the ways in which recent biotechnological developments have led to improvements in food processing. Deals with biotechnology based processes currently in use by or available to the food industry. Building on a series of case studies selected to illustrate the diversity of applications it clearly shows that biotechnology can and will benefit the food industry. The need for a cost-effective training scheme for new and existing staff at all levels has been met by the University of Greenwich (formerly Thames Polytechnic) and the Open University of the Netherlands. As part of the European Community Education and Technology Training initiative (COMETT) and in conjunction with a number of other leading UK and European universities, they have developed BIOTOL, a training scheme in biotechnology using open learning materials, which will provide tailor-made courses, flexible in content, pace and place. INCLUDE: Processing aids for the food industry: the state of the art; Fermented foods - an overview; Starter cultures of cheese production; Chymosin: production from genetically engineered micro-organisms; High fructose corn syrup; Fruit juices; Amino acids: their production and uses in the food industry; Appendices - EC directive - genetically modified micro-organisms; Regulatory position of chymosin.